With hit TV shows like American Idol, Dancing with the Stars and others showcasing talent, it is no wonder today’s youth are interested in and aspire to chase after their artistic dreams. Realizing the importance of having a positive outlet for the youth to use their gifts, Yvonne Brake began her own God-inspired ministry right here in Akron in 1980. Because He Cares (BHC) began as a youth drama group after Yvonne Brake, Director of Development at Haven of Rest Ministries, had a vision for using the arts to share the message of Christ. It was then that she began providing opportunities for youth to explore their own talents. With the epidemic of teen suicide, pregnancies and other issues that have been running rampant among our youth, this ministry has found a key in reaching the culture on topics they care about. They do this through drama, skits and plays that have a way of touching hearts more just than words ever could. Currently their student leadership program at Perkins Middle School gives students the opportunity to broaden their horizons through the use of media and puppets to convey a message to their peers that they feel is important. “Last year they did a video on bullying, something that has been in the headlines lately. The statistics on it show something like 160,000 kids miss school due to bullying, and its effects seem to be very long term,” Daren said. BHC teaches Student leadership skills as well as the importance of giving back. 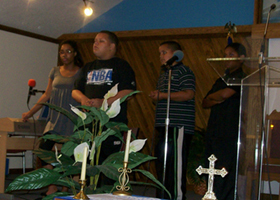 The youth were involved in a canned food drive for OPEN M, a ministry which reaches out to the less fortunate. The BHC kids have plans for more initiatives in the future. “We’re trying to teach them about being a leader and putting out positive messages, but also the importance of giving back,” Daren said. In the past, the ministry produced inspirational radio spots on WCRF. They also created a video about teenage suicide in the late 1980’s titled “Are They Crying Too Softly?” which aired on several local TV stations and was shown in area churches. Requests for performances poured in, leading them to schedule up to 160 activities a year. 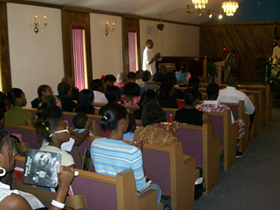 They provided programs and services to more than 125,000 people in school systems throughout Northeast Ohio, as well as in churches, universities, correctional facilities, drug rehab centers, and community organizations. In the early 1990’s BHC produced a weekly radio program, “Drama in the Inner City” on WHLO. Today the Brake family goes into public schools. Although they don’t go in with their Bibles or a sermon, they do incorporate their faith by their example. 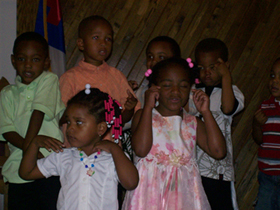 As they get to know the kids they ask questions about their lives and are able to give them godly direction and advice. Their ministry covers a variety of different areas, from going into the schools, to putting on plays, to getting kids to think about and work towards their dreams for the future. They currently offer two programs: Child Enrichment in the summer, and Student Leadership, an after school program. Student Leadership includes a Media Club where children learn about different media and are given hands on experience with video equipment. They also gain leadership development skills and are tutored. 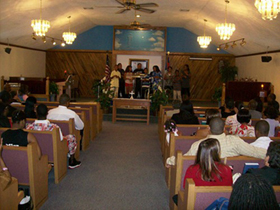 People often ask, “Can you come and do something like this at our church?” So part of BHC's ministry involves traveling to churches and schools, even in cities outside of Akron, to teach people how to start similar programs. “We see ourselves as a tool for jumpstarting youth ministry. If you want something different we can come in and work with you,” Darryl said. And you don’t necessarily have to be an actor or actress. There are many different roles to be filled in order to put on or facilitate a performance. Therefore, the ministry's goal is to broaden the youth’s horizons, so that their worlds aren’t so small. Most of the kid’s worlds are so small because they normally consist of the two blocks that they live on. “A person can become very narrow and that can be dangerous at a young age,” Daren said. Among BHC's dreams for the future is a Ministry Impact Day for which they have already assembled a committee from various churches to help with the planning. “It will be day of fellowship and equipping people who have a heart for ministry,” Daren said. The focus will be three fold, including Purpose and Vision, Generational Poverty and Ministry to the Poor, and Using Your Gifts and Talents. “It will be a place where people who have a heart for ministry can come and get the fire rekindled and fellowship with others who have the same heart and passion for ministry,” Daren said. In the future they also hope to put on a citywide evangelistic play for the church to bring their un-churched friends to without it being threatening.